I need some help. I trying to finish up quilting my husbands quilt. Well I have about 80% quilted okay. Well my machine started to mess up. This is what it's doing. I have changed the needle and messed with the tension and no change. I am not understanding why it's doing this. I am getting these single loops now. Rethread your entire machine, take the bobbin out, put it back, clean it out while you are there, and see if that will work. Also, turn it off, wait a couple of minutes, and then turn back on. Have you recently broken a needle. The reason I am asking is when I started having problems FMQ a broken needle tip was in the bobbin case and made a slight burr in the CHook and had to be buffed out. 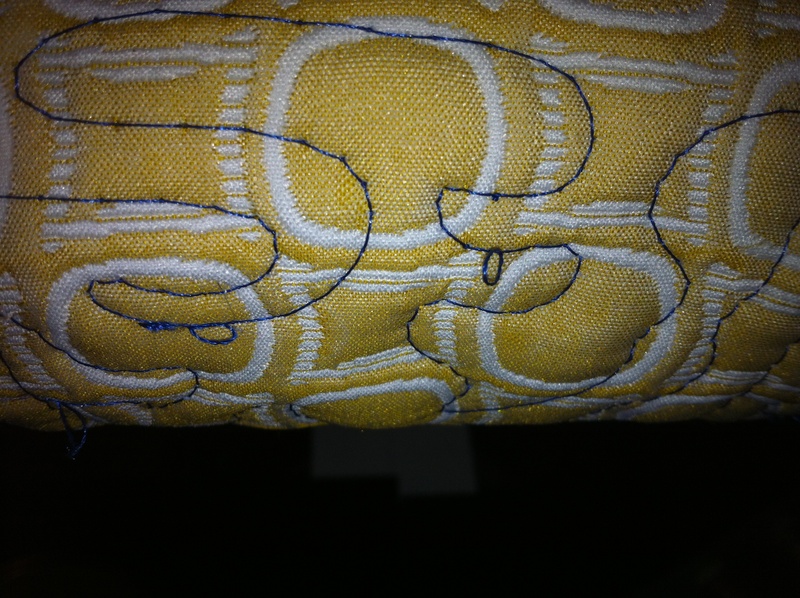 That was on a Bernina. Now when I break a needle I search and make sure not the tiniest piece is hidden. I think maybe you are moving the machine or your hands a little too fast and it's not letting your stitches form the way they should. Didn't break a needle bent it really bad. I thought I was going too fast too. So I slowed down still getting the same problem. Waiting for baby Taylor to go to bed then I can mess with it more and change that bobbin. Having had a similar problem, have you made sure you put the presser foot down? I tried everything that has been suggested and then someone mentioned this to me. Voila - that was my problem all along. check the bobbin area and make sure there isn't a tiny piece of thread caught in there somewhere, and make sure the needle is seated correctly. I think we fixed it. It was the metal plate that is to access the bobbin casing and clean the dogs out. I think over time with us trying to free motion quilt and use breaking needles we needles the plate was nicked and had rough edges where the needle entered it would snag the thread. I am gonna put the maching back on the frame and try to quilt the quilt. The samples came out good. Make sure the presser foot is down. Clean, rethread and watch your speed. Put the quilt in the closet. Make a pot of coffee. Take a nap. Take a bath. read a Quilting magazine. Then go to the sewing machine. Completely rethread it . Stitch on a scrap to check tension. Now get to the FMQ.. Good luck and hugs and patience. I notice you are using black thread. Try stitching something with another color thread. The only time I ever had trouble with my machine" acting out" was when I had a bad spool of black thread and didn't realize it. I did everything I could and finally took it to the dealer for clean, oil & adjust. They did all that,sewed out their test and it was just as bad as mine so they redid everything and had another tech stitch-same thing so they set it aside until the next day. For some reason the next day they just automatically took everything off, including the thead I had left on, redid all the work and put the red thread they usually used so the stitches showed up nicely. Perfect!!! They couldn't believe it so tried the black thread again & it went back to the bad stitches. They concluded the spool was probably old, even though I had purchased it from them. They tried another spool from the store and all was well. Lesson learned now I buy only small spools of black. It may be that the bobbin is not wound as your machine likes it. I had this happen and once I changed the bobbin it was not happening anymore. 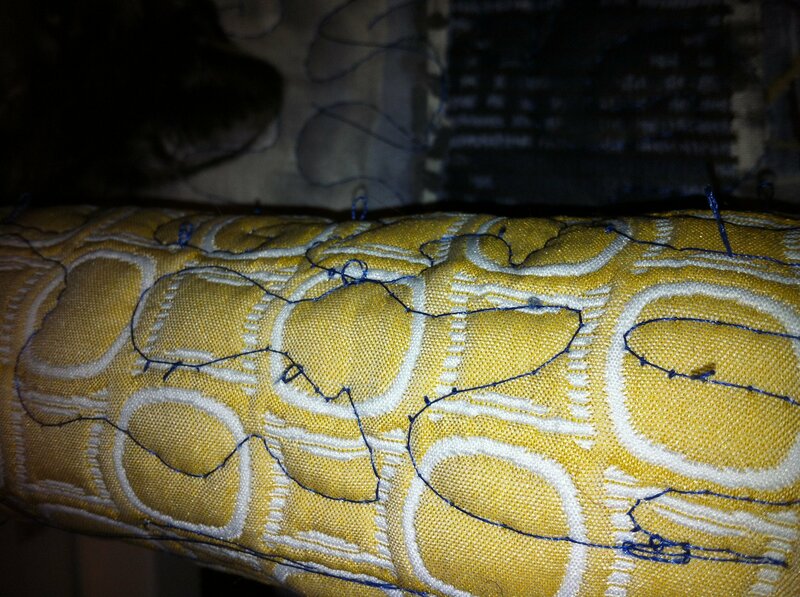 I think that I used some "out-dated" thread on the bobbin. Who knew that thread had a "use-by" date? Good luck. I've had this problem. It is mostly caused by the top tension being too tight, and it brings up the bottom thread too far. Also, try a Schmetz topstitch needle, probably a size 14 (but maybe a 16) and that should help. If your hands go slow moving the fabric, your foot pedal should go fast. May be out of time from needle hitting wrong and bending. Had that happen and had to take it to be serviced. If the other things don't work you may have to take it to the shop. i actually was thinking of doing that if i didn't find the problem. Some times beating electronics makes them better. Lol. Hopefully this afternoon before our father days celebration I will try it. i am also new to fmq and this happens to me alot.. i found what i was doing was moving the fabric to fast and the needle doesn't seem to be able to keep up.. when i slow down it doesn't happen near as much. when i move the fabric too fast i bend the needle slightly and it can't seem to connect correctly.. or at least thats what i think.. Might be all wet but slowing down solved a lot of it for me. Did you try taking off the throat plate and cleaning in there? Maybe threads caught, lint or part of a broken needle in there.